Each year, PwC conducts a survey of CEOs from around the globe and across a range of industries about their outlook on the global economy and business landscape. The 2018 survey of 1,293 CEOs from 85 countries reported a noticeable difference from surveys of the recent past. In previous years, when asked to consider how concerned they are about threats to their business’s growth prospects, CEOs around the globe had generally agreed that they were “extremely concerned” for direct business risks. 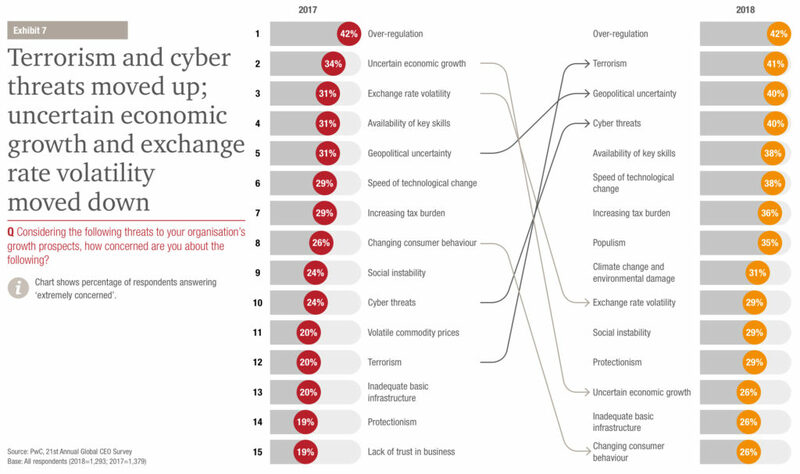 For example, in the 2017 survey ‘uncertain economic growth’ (34%) and ‘exchange rate volatility’ (31%) were two of the top three ‘extreme concerns’ of CEOs. While ‘over-regulation’ has been a mainstay at the top of ‘extreme concerns’ since 2008, what is striking about this year’s survey is how dramatically economic indicators have been replaced with societal ones. Global macroeconomic trends have CEOs optimistic about specific business challenges but are “more troubled by larger societal and geopolitical shifts.” Among North American CEOs in particular, “the level of ‘extreme concern’ regarding terrorism has more than doubled” – from 20% in 2017 to 41% in 2018. The concern over terrorism and other societal risks to business continuity is not entirely surprising. Companies with a global presence face unique challenges in fulfilling their duty of care. A travelling workforce that seeks business opportunities across the globe presents challenges of accountability, communication, safety, and security to organizations. Twenty-first century solutions are required for twenty-first century risk. Travel risk management feels especially pressing when considering the attention paid to high-profile terror attacks in both the U.S. and Europe. Between the seven major attacks on soft targets in Europe since November 2015 to the numerous acts of terror experienced in the United States in recent years, the threat of terrorism is fresh in the minds of the global citizenry. A state of “permanxiety” has set in for domestic and international travelers – business, leisure, or otherwise – and companies have an obligation to maintain a high level of safety in their business operations. 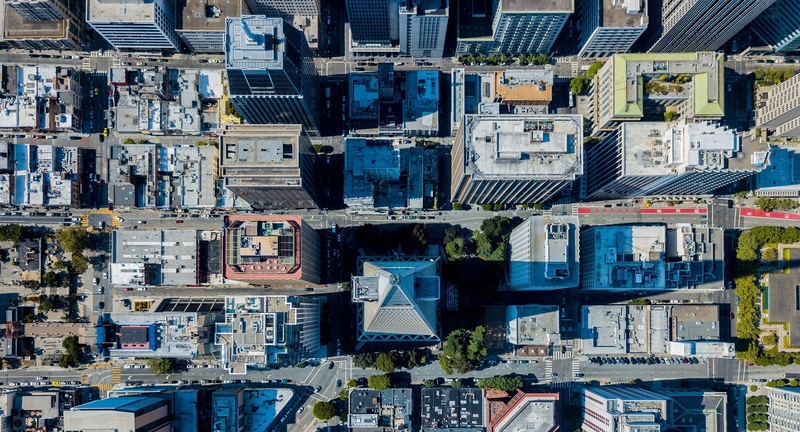 Managing extreme levels of concern for societal and geopolitical risk is made easier with GuardianAngel, a travel risk management solution designed to meet the needs of a modern, mobile workforce. We provide operations management, enhanced situational awareness, and a common operating picture to travel managers so that they may actively manage, mitigate, and respond to risk anywhere on the globe. Through our travel risk management solutions, GuardianAngel delivers on the promise of providing Peace of Mind to company leadership. Fulfilling duty of care is an obligation for any organization that maintains a globally dispersed workforce. A travel risk management program by GuardianAngel will help ensure that your personnel returns home safely, no matter what. Source: PwC, 21st CEO Survey: “The Anxious Optimist in the Corner Office”. Peace of Mind is knowing that your workforce has an unblinking eye keeping them safe at all times. Mitigating risks and optimizing the safety of your assets requires having a fully integrated, real-time view of your operation. Rather than risking your personnel, your assets, or your financial stability, integrate GuardianAngel to optimize your operations management. Our platform enables you to secure your assets and conduct business anywhere in the world. 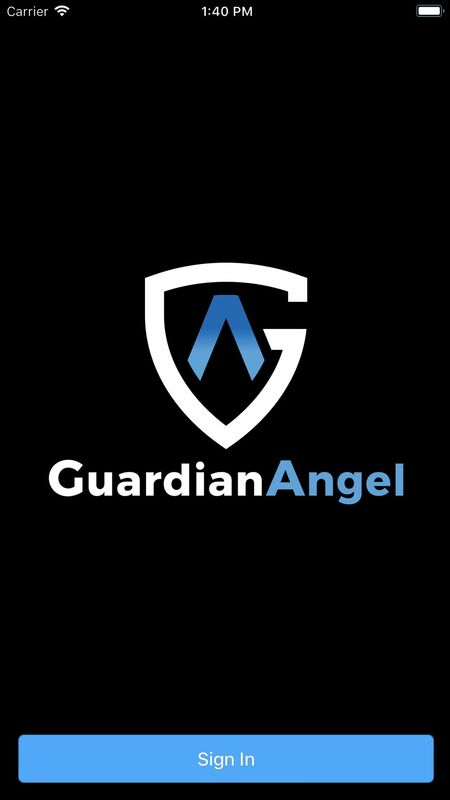 GuardianAngel allows you to cultivate valuable opportunities and participate in the global community without putting your risking your personnel.